Prep chicken: For healthiest chicken, poach: Place boneless, skinless chicken breasts in a medium skillet or saucepan. Add lightly salted water (or chicken broth) to cover and bring to a boil. Cover, reduce heat to low and simmer gently until the chicken is cooked through and no longer pink in the middle, 10 to 15 minutes. Separate biscuits and place each biscuit in a cup of a lightly greased 12-hole muffin pan, pressing dough up sides to edge of cup. In a medium bowl, combine chicken, chicken soup, veggies, cheddar cheese, parsley flakes, and black pepper. Mix well to combine. 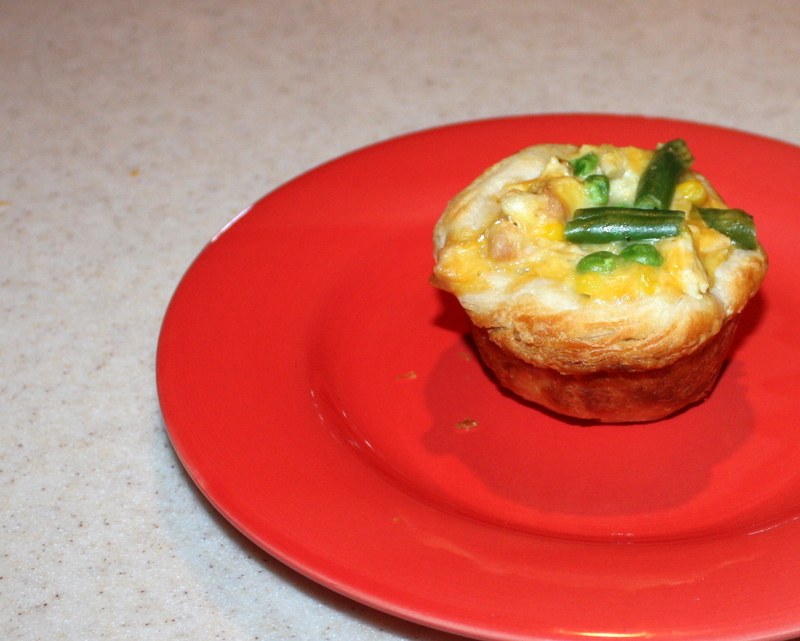 Evenly spoon chicken mixture into prepared biscuit cups. Remove from oven. Place muffin pan on a wire rack and let set for 2-3 minutes. Serve at once. When I make these again (and I will – for they were delicious! ), I won’t use Homestyle Biscuits. I will either use flaky biscuits and divide into sections or I will use puff pastry. The crusts were just thicker than Hubby and I liked. Think I will also add mushrooms and a little more seasoning. That said: these pot pies were very very good. *I filled the remaining four muffin tins with wheat and white bread, crusts removed, flattened (although these were very good – not as good as the biscuit dough crusts). Note: rather than making the cake from scratch, you can use a vanilla/yellow box cake mixed with 1 stick melted butter and 2 beaten eggs. I didn’t have regular cream cheese and used cream cheese with pineapple – turned out to be quite tasty! Interesting that the topping makes a ‘crust’ and also ‘seeps’ through the cake layer and thus flavors the bottom of the cake. This is a very tasty cake! The photo on Facebook did not have a ‘crusty’ top; perhaps I baked a little longer – or maybe my oven was temperamental. At any rate, it is doubtful that it changed the flavor, for this cake was very very good! To make the cake layer from scratch, cream the butter and sugar on medium-high speed in the bowl of an electric mixer until light fluffy, about 5 minutes. 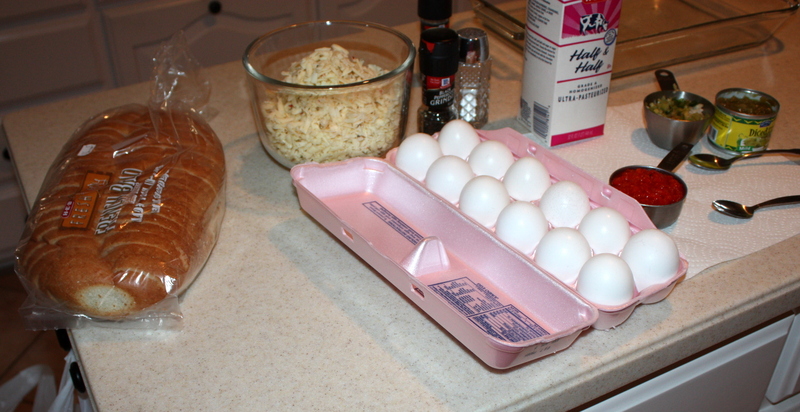 On medium speed, add the eggs, one at a time, then the sour cream, vanilla and lemon zest, scraping down the bowl as needed. Mix well. Sift together the flour, cornstarch, salt and baking soda. With the mixer on low speed, slowly add the flour mixture to the butter mixture and stir until smooth. Finish mixing by hand to make certain the batter is well mixed. Pour the batter evenly into the prepared baking pan. Mix the ingredients for the topping and spread evenly over the top of the batter. Bake for about 30-35 minutes and let the cake cool before removing from the pan. 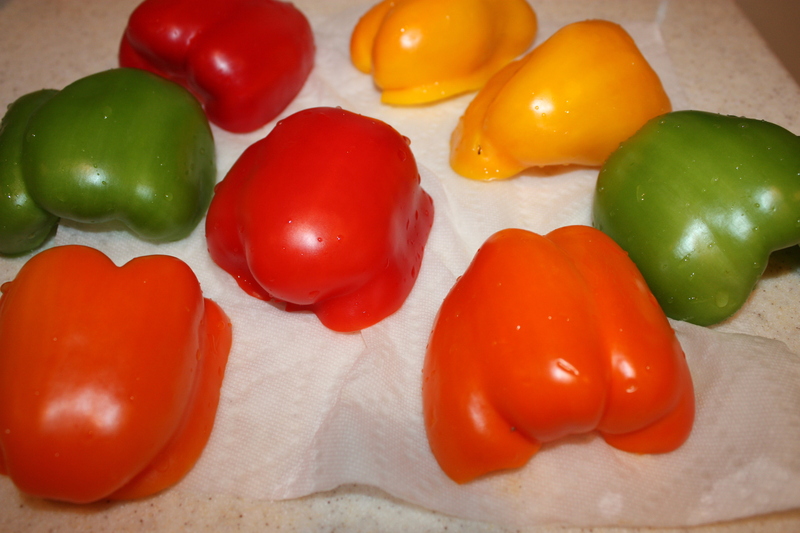 Wash peppers and cut in half, lengthwise. Scrape out seeds and place in baking dish and set aside. Brown ground beef and drain excess juices. Add meat to large bowl and set aside. Cook rice according to package, using chicken broth instead of water. Add rice to the cooked meat. Drain corn and black beans (rinsed) and add to the rice-beef mixture. Add salsa and 1 cup of cheese to the mixture. Add seasonings and mix thoroughly. Spoon the mixture into the peppers and place b back into the baking dish. Cover with tinfoil and bake for 45 minutes. Remove foil and top with remaining cheese (as much as you wish!). Sprinkle green onions and cilantro on top and place back into the oven for another 15 minutes. I just poured the left-over mixture (after filling the peppers) over the top before baking. 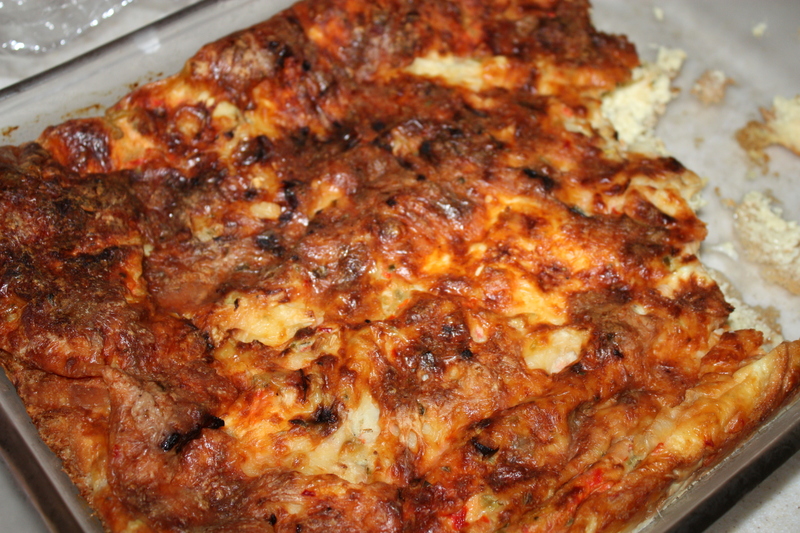 I also covered with cheese and baked – then, added more cheese for the last 15 minutes. We do love the cheese! Top with sour cream or more salsa – or Jalapeno peppers if you wish. I thought about topping with avocado (but thought of it too late!). I obtained this marvelous recipe on Divalicious Menu posted on Facebook. We really – really – liked this dish! Arrange the cheese slices on another parchment paper-lined baking sheet in rows—without any seasonings. Bake until well-browned and crispy, about 7 and 7 1/2 minutes. If undercooked, they’ll be soggy, so don’t be afraid to check them and put them back in for more time, if needed. Cool the crisps completely before serving—as they cool, they’ll crisp up quickly. Store on the counter in an airtight container for a few days. Note: I cut some slices too thick and also placed them too close together on the parchment sheet. Not to worry, though – they were still delicious. Much of the oil in the cheese will bubble out. Quickly dab the cheese with a paper towel to soak up the oil. Of course, I’m a Cheese Lover – and I really loved these crisps. For the life of me, can’t recall where I obtained the recipe (on the internet). Thank you – Cheese Crisp Cook, whoever you are!! Mix all cake ingredients except chocolate chips on medium speed for 3 minutes. Stir in chocolate chips, preheat oven to 350 degrees F. Grease and flour Bundt pan. Pour in batter and bake for 1 hour. Cool and remove from pan. Mix the Bailey’s and sugar together. Pour glaze on top of cake when completely cool. Cook ground beef until meat is browned; drain. Stir in beans, tomato sauce, taco seasoning mix, diced tomatoes and 1/4 c. of cheese. Sprinkle 1 cup corn chips in bottom of 8×8 baking dish. Cover with chili. Bake at 350 for 20 minutes. Spread sour cream over chili. Top with remaining corn chips and cheese. Bake 4-5 minutes longer. Mix the first 4 ingredients and pour into a baking dish. Drop pie filling or fruit (cut up into pieces) into the filling. Bake at 400 degrees F. until brown on top. Serve with cool whip or ice cream of your choice. Note: If using a 9”x13” baking dish, double this receipt and use a 29 ounce can of fruit. You can add a couple of tablespoons of the peach juice to the batter (which I did) and sprinkle with cinnamon. * In a large bowl, mix together cooked pasta, beef, sauce, onion, red pepper and 1 cup of the shredded cheese. * Place pasta mixture into baking dish and cover with lid or aluminum foil. Bake for 30-35 minutes. * Take dish out of the oven and remove cover, top with remaining 1 cup of shredded cheese and sprinkle with parsley. Bake for another 8-10 minutes. Makes 4-6 servings. This recipe can be double easily and cooked in a 10”x13” baking pan. 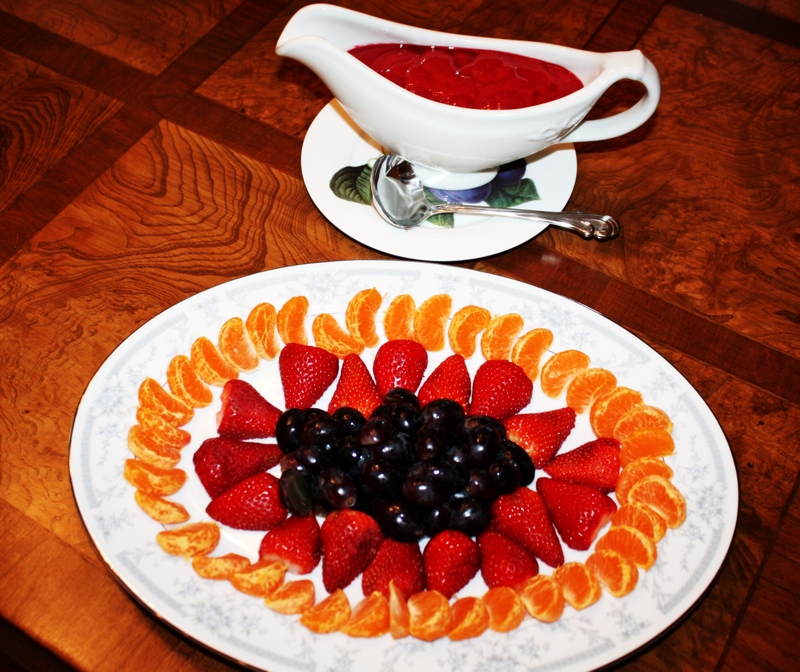 Arrange fruit on large decorate platter. Puree sauce ingredients and serve in small pitcher on side. Note: use other fresh fruit when available: blueberries, blackberries, raspberries, peaches, nectarines, melons cut into thin wedges. If you refrigerate the strata make sure you allow extra baking time. Whisk half and half, eggs, salt and pepper to taste until smooth. Adjust oven rack to middle position and heat oven to 325 degrees. Bake until custard is just set, 50 minutes to 1 hour. 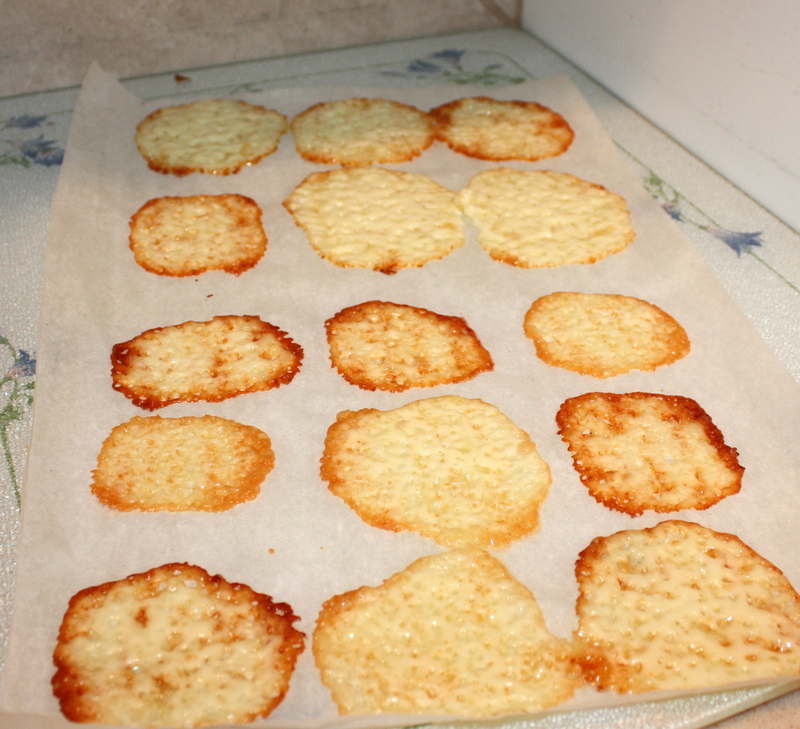 Without adjusting oven rack, turn on broiler; broil until strata is spotty brown and puffy, about 5 minutes longer. Remove from oven, let stand for 8 to 10 minutes, and then serve. 12 oz. linguine, cooked & kept warm – break the noodles in half before adding them to the cooking water, this will make them easier to mix. Preheat oven to 350 degrees. Spray a 9×13 inch baking dish with non-stick spray (a tip: to avoid getting the counter messy with overspray, open your dishwasher, set the dish on the open door & spray, it will get cleaned up next time you run your dishwasher). Add butter and onions to a large non-stick skillet, sauté over medium heat until soft, add the garlic on top and stir around for a few minutes. Push the onions and garlic mixture to the side of the pan and add the chicken pieces to the center. Sprinkle chicken with salt & pepper. Cook for 6-8 minutes, moving the chicken around as needed, until the chicken is cooked through. Remove pan from heat, stir in mushroom soup, sour cream, 1/2 cup of water (or chicken broth) and cheese. Stir until combined – then add the frozen peas. Now mix in the linguine and pour into prepared casserole mix. Top with crushed crackers. Bake for 30 to 40 minutes in 350 degree oven. We really really liked this dish! Actually made it (for the first time – which I realize is a “no-no”) to take to a church function. Hubby and I ambled to the serving line where this dish was so we could taste it. Of course, if it had been horrible I would have regretted taking it without sampling first. However, it just seemed to be a winner with all of those great ingredients. And it was. Next time, I plan to add chopped red pepper and some diced celery.